2. In a large heavy saucepan, melt butter over medium heat. Heat 5-7 minutes or until golden brown, stirring constantly. Immediately stir in sage and salt; remove from heat. 3. 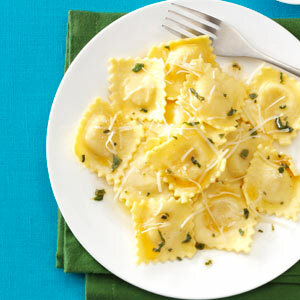 Drain ravioli, reserving 2 tablespoons pasta water. Add ravioli, pasta water and lemon juice to butter mixture; gently toss to coat.